VIA ROUTE 46: Traveling West on Route 46, go 1/4 mile past Baldwin Road. Turn right on small road at the end of the Walgreen’s Shopping Plaza directly opposite Pep Boys Automotive. VIA ROUTE 10: Traveling West on Route 10 to I-287 North. Take exit 41A (Smith Road/NYC). Turn left at the light onto Smith Road. Turn right at the next light onto Route 46 East. Take the jughandle at Baldwin Road so traveling on Route 46 West. Turn right on small road at the end of the Walgreen’s Shopping Plaza directly opposite Pep Boys Automotive. 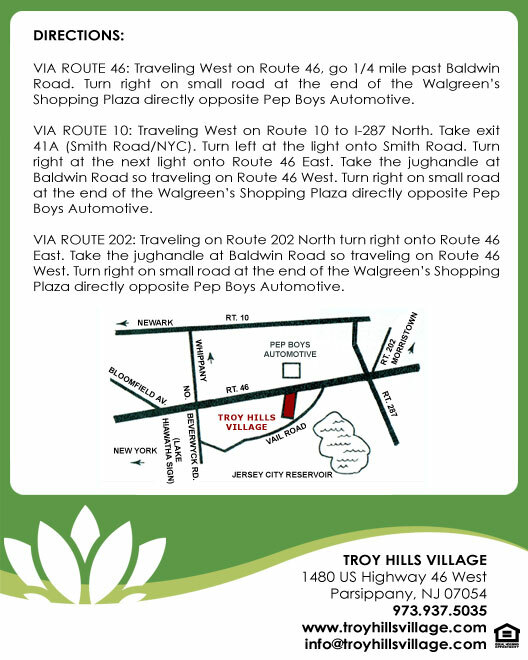 VIA ROUTE 202: Traveling on Route 202 North turn right onto Route 46 East. Take the jughandle at Baldwin Road so traveling on Route 46 West. Turn right on small road at the end of the Walgreen’s Shopping Plaza directly opposite Pep Boys Automotive.